Home / Blog / Can Air Gages Be Used To Measure Very Tiny Holes? Air gages offer exceptional flexibility and versatility when it comes to measuring dimensional and geometry characteristics, such as clearances/interferences; heights; thicknesses; feature locations; inside and outside diameters; parallelism; squareness; roundness and many more. Chances are you may have also use air gages to measure counterbores, blind holes, or very deep bores. Now, can this relatively simple technology measure tiny small through holes? Thanks to their tremendous adaptability, the answer is yes! Traditional air gages that are designed to measure inside diameters are typically limited to a size of approximately 0.060 inches; below that, it becomes difficult to accommodate the precision jets/orifices and machine air passages in the plug tooling. Don’t worry. What you need is a simple change of approach. It is possible to tweak air gages to measure small through holes that are less than 0.040 inches in diameter. A majority of air gages measure back-pressure that builds up inside the system, especially when the tooling is positioned near the workpiece. Doing this often results in higher air pressure, which the gage comparator will convert into dimensional value. That’s why back-pressure air gaging has been used in an array of specialty applications, ranging from measuring hypodermic needles, fuel injection components, and more. To make things easier, one can consider using a special holder that allows parts to be attached quickly while maintaining good air seal. Once air flow and pressure are stabilized, you are ready for high-volume inspections. With the availability of flow-type air gaging, one can even measure internal diameters that are as small as 12 micro inches, and as large as 0.050 inches. There many be some cases where the holes are too small that air flow becomes negligible. Don’t worry; operators can engineer bleeds into the system to boost the total flow to a measurable level. If you need to reduce the air flow through large bores, you can engineer restrictors into the system. Go & No-Go gaging: Used with precision wires, this method is suitable for very low volume tasks. Optical comparators and microscopes: This method does not suit high-volume production applications but works decently for certain applications. In addition, the method only accepts a limited number of configurations. Two-station air gages: Fuel injection components often feature two holes that share a common air passage. In addition, they need to be measured twice; once independently, and once simultaneously. With that said, custom two-station air gages have been designed to accommodate this requirement. The first station will connect the air circuit to one of the holes while blocking the other. The second station then connects the air flow through all the holes. Do you need to measure bores of various sizes? 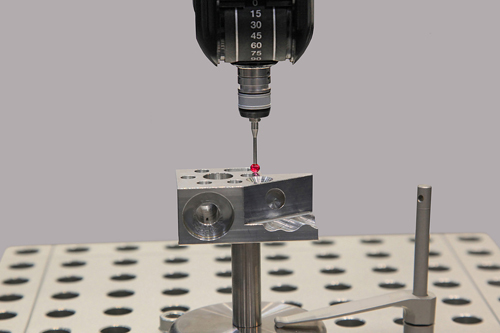 Are small holes making measurement tasks difficult for you? Don’t hesitate to reach out to Willrich Precision for assistance. Our team can help you find the best air gaging system for your application.